Whispering Oaks Cottage: Happy Halloween!!! It's been awhile since my last post, and I have missed you all! I just wanted to share some Halloween pictures with you. 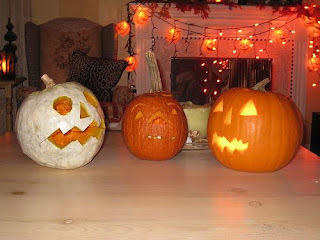 Next up, meet Harry, James, and Lazy Eye Lynn...they are pumpkins a good friend and I carved last year...sad to say, they only survived a few days! Now they are just a memory! Ahhh, I love Flickr! I created this image using Flickr toys. Please visit my Flickr page for credits! Fabulous Halloween pics! 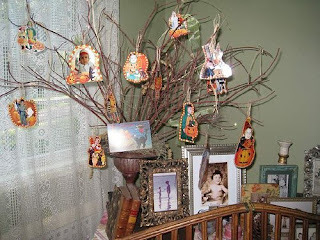 I LOVE the idea of a tree decorated with pictures from Halloween past! I use to do the tree for Easter but it is so suitable for every holiday, so practical. I missed you, hope you are not going away again. Wishing you a great and fun time with your family. Happy Halloween!!! 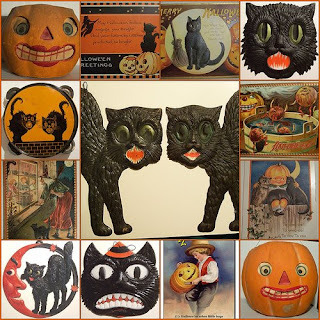 It is always so good to see a new post up for you...I hope your halloween was good...mine was. sweet halloween pictures! hope you had a fun one! Ididnt do much on halloween considering all the fuss over getting set up and ready for halloween.. oh well.. thats the part i like the best.. the fussing about with all the cute little halloweenie things! You were missed so much sweet friend! I well remember your wonderful Halloween things and had hoped you would be able to pop in and post some of your pretties! Thanks for the comment! I am so excited to find others as excited about their cottage as I am about mine! I love all your fall decor you have posted! Thanks for the add! Oh, very cute!!! I love all the black kitties! Love the Halloween tree (although I'm fashionably late coming over to see it!) Hope you post your Christmas decorations! LOL!